The rapid development of the Trupart Filtration programme has been supported by the publication of a brand new 2012 Filtration catalogue to include the many hundreds of new references added in 2011. To obtain a copy of the new Filtration catalogue quote ‘CAT67’ when placing an order. Trupart has published a brand new edition of its Brake Disc & Drum catalogue to bring its range totally up to date. Discs & Drums remain one of Trupart’s core product areas and the range has been consistently extended to reflect the abundance of new vehicle introductions in recent years. To obtain a copy of the new Disc & Drum catalogue quote ‘CAT 66’ when placing an order. Alternatively you can download an up to date desktop version of the complete Trupart parts catalogue free of charge by visiting our catalogue page. Within the 2011/12 edition of our Wheel Bearing catalogue, we state on page 94 that TBK1368 & TBK1369 fit the Volvo C30, C70, S40 & V50. This information is incorrect as these bearings only fit the Ford Focus and Focus C-Max. The correct Wheel Bearings to suit the Volvo models are listed in the table below. Trupart has launched a brand new 2011/2012 edition 'Suspension Wishbone & Track Arm' catalogue following the introduction of over 200 new references. The latest edition contains around 700 part numbers and includes both a comprehensive cross reference section and a fully illustrated buyer's guide. To obtain your copy of the latest Wishbone catalogue please quote CAT 65 when placing an order. Alternatively you can download an up to date desktop version of the complete Trupart parts catalogue free of charge by visiting our catalogues page..
Click on the link below to go to the TRUPART WEB CATALOGUE where you can then select the NEW TO RANGE option from the left hand menu. You can them browse our new product items for all product groups and also see detailed technical information and a full buyers guide for each new part number. The brand new 2011/2012 edition of the Trupart Wheel Bearing Kit catalogue represents a significant investment in what has rapidly become one of Trupart’s fastest growing product groups. The Trupart range follows the OEM requirement for full kit components and all Trupart references are now supported by photographic images of each kit and its contents. These can be viewed on our electronic catalogue. This latest version of the Wheel Bearing Kit catalogue includes over 200 new to range kits making the Trupart range one of the best currently available in the UK. The new edition also incorporates a detailed buyer’s guide and a comprehensive cross reference section. To obtain your copy of the new catalogue quote 'CAT64' when placing an order, alternatively you can download a free electronic version from the PDF section of our catalogue page. 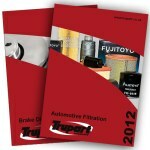 Trupart's 'award winning' Wiper Blade programme is now supported by a brand new and comprehensive 2011/2012 catalogue. The latest version incorporates all of the new references added to range throughout the last 12 months and now includes a detailed fitting guide for the innovative 'multi fit' Flat Blades. To obtain your copy of the new Wiper Blade catalogue quote 'CAT63' when placing an order, alternatively you can download a free electronic version from the PDF section of our catalogue page. Our surplus stock is now on-line. An important part of our role as a leading supplier to the automotive aftermarket is to ensure that our product ranges are alway up to date. This requires continual re-adjustment and updating of our stock profiles which causes many parts to be identified as slow moving or even obsolete. These parts are regularly offered to our existing distributor stockists at discounted prices. These same parts are now being offered to the private motorist via an eBay store. We must stress that this is only for surplus stocks which we have already offered to our own customers. The alternative is to throw them away and that makes no sense at all. You can view comprehensive lists of our surplus stock and find out more about our stock cleansing policy, and how to purchase items on eBay, by clicking the link below.